STUDENTS from St Laserian’s School, Carlow did themselves and their school proud when competing at the recent Special Olympics Leinster Artistic Gymnastics Development Day in Wexford. Six students took part and all won medals on the day. 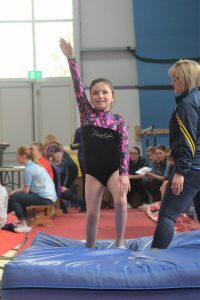 Selena Carr from Carlow town, competing for the first time, won gold on the floor, gold on the vault and silver on the wide beam. Ellen Byrne from Tullow, another first timer, won gold on the floor, silver on the balance beam and a ribbon on the vault. Wicklow’s Ava Crampton Clarke won gold on the wide beam, gold on the vault and silver on the floor. Josh Roberts from Myshall took home silver on the vault and bronze on the floor. Zac Feeney from Carlow Town won gold on the floor and gold on the vault. Leah Cummins from Ballon was also taking part in her first comeptition and she won gold on the vault, silver on the beam and bronze on the floor.